I went on a tour of Magical Bridge Playground in Palo Alto last week and I’m so excited to see it open in Mountain View soon. They’re in the final stages of fund-raising, so if you know of any companies or individuals that might want to donate/sponsor the magic, now is the time to do so. They still need 950K before they can start construction in Rengstorff Park. 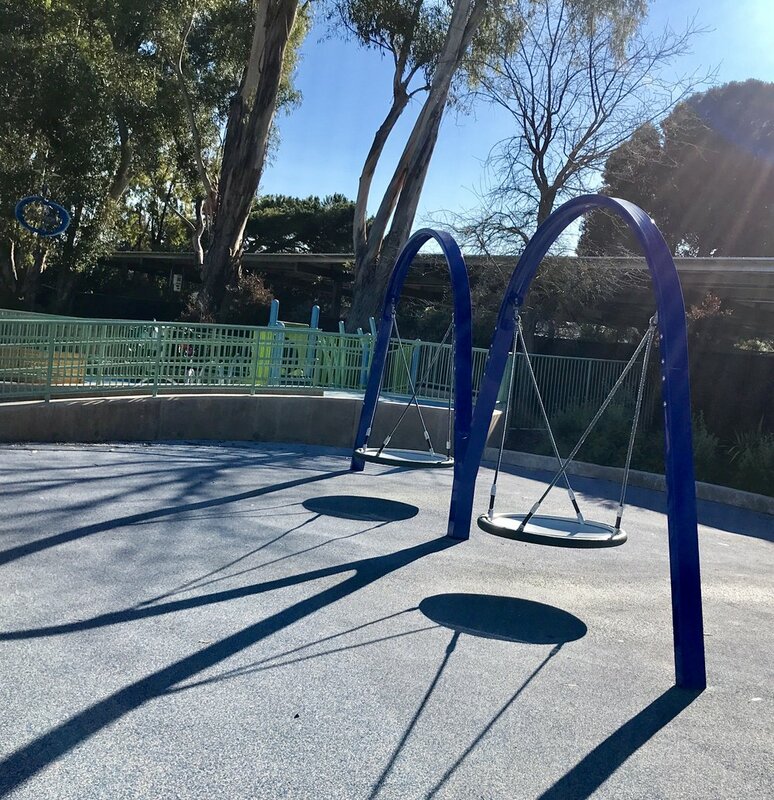 Magical Bridge Playground in Mountain View will welcome visitors of ALL abilities, including those living with physical and cognitive disabilities, autism, visual and auditory impairments, and even the aging population. That’s so cool! If you make a donation of $300 or more, your name will be included on the donor wall and you can add a brief message to your tile. Every donation helps and is needed. Another coin drive at the public Mountain View elementary schools will be happening soon, so please be sure your children collect their pennies, nickels, dimes and quarters (and dollars, too!). There are different dates for each school and I’ll share that info when I hear more. Here’s the heart warming story of the history of Magical Bridge. I love that Magical Bridge is a playground for everyone, all ages and sizes. It’s not a “special needs” playground and it solves the problem that was created when the ADA made requirements on playgrounds that were way too low. Along came a group of Silicon Valley parents, who did what we do here, created something that had never been done. Over 25k people per month visit the Palo Alto park. The Laser Harp is the best part. That’s where you’ll find me when it opens in Mountain View in 2020. The Treehouse and bridge are adorable. I love the concrete benches that look like logs. There are small huts, or cocoons, for kids that don’t want to interact with everyone else. It also has game tables, disc and bucket swings for everyone, a community stage, smooth seamless paths and turf, tactile slides and surfaces, and distinct zones for predictable play. Honestly, it’s unlike anything you have ever seen. 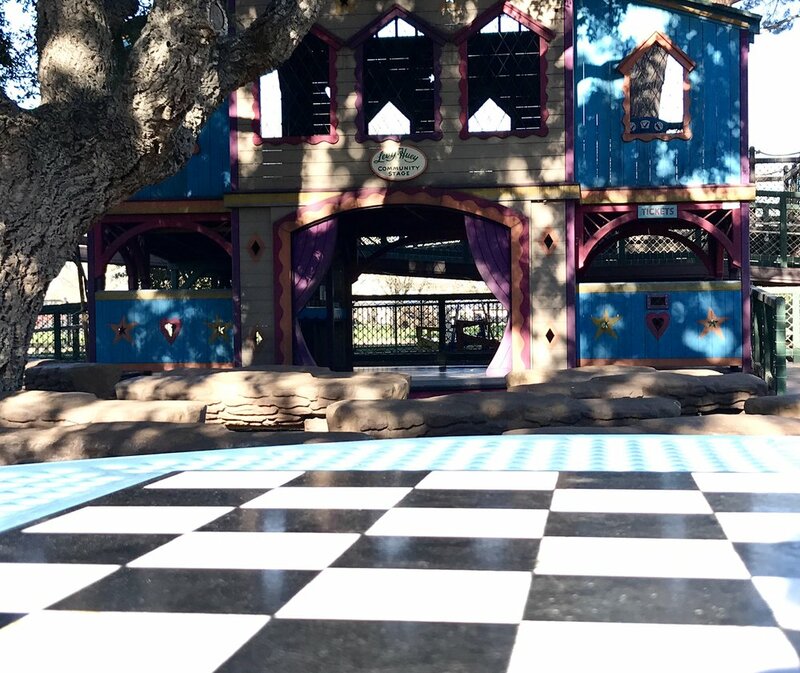 Visit the Magical Bridge Playground at Mitchell Park, 3700 Middlefield Road in Palo Alto. Just a few steps from Magical Bridge in Palo Alto is a sad little 1990s playground. No one was there when Jill Hoffspiegel Asher (one of the founders of Magical Bridge) took me on a tour. She pointed out several aspects of the park that made it ADA compliant. One of them was a platform for special needs kids to sit on… Are you kidding me? And another was a pipe thing to talk into, and hopefully another kid would be on the other end to reply. It’s so ridiculous that those two lame features were all it took to be ADA compliant. And now these magical Silicon Valley parents came along and totally disrupted the whole playground game! It makes me proud of my community and I can’t wait for Magical Bridge Mountain View to open. Donate here and kindly give everyone in Mountain View the chance to play.